art by michael perchard: "Springtime In New England?" Love the snow but didn't want to wait for Spring! I so love plein air painting! good to see you out there pushing the season Michael! Thanks my neighbor to the north! How has your winter been Sally? How was New York? I bet you had a ball! Funny to see the flowers in the snow! Friends on Face Book are getting a kick of the photo! I do love Spring but I also love winter!!! Hello Catherine! So glad you got a laugh from the photos! So very good to have some fun! Funny though more snow came and covered my "flowers!" Now I am waiting for a thaw to see them emerge through the new snow! Fun is good! You are so funny! Love your harbingers of Spring - which is sure to come soon! Hello Susan! Glad you enjoyed the post! I couldn't stop laughing while I was out painting! I am still smiling thinking about it! Much fun! All my neighbors had a good laugh!!! Glad you love it Celia! I loved doing it! Still laughing!!!!! Now all "flowers" are covered in new snow!!! I will have to wait for spring for real and painted flowers! Your sense of humor is in tact! Humor isn't easy this winter of winters. I love seeing blooms in your yard and not your roof. Brilliant. PS. What paint did you use? Acrylic? Has to be. Thought I'd follow your act. Ola amiga! Hi Linda! Trial and error! Mostly error! Acrylic! But the brush kept picking up the snow! Finally I sprayed the snow with water. Water froze then the acrylic adhered so much better! Have fun and please post photo! And a beautiful canvas it is!!!! Hang in there Michael...Spring is coming!!! Hello Hilda! You are right a very beautiful and very large canvas! Tough to paint on snow!! Next time I will "mist" wet paint onto this cold and fluffy canvas!!!! LOVE your flower paintings Michael! You are so funny and original! Hard to imagine spring is just around the corner when looking at your photos. It's also hard to imagine how your garden can bounce back to life after being covered in snow for so long - it remains a mystery to me!. I'm looking forward to seeing your crocuses again! I've so enjoyed seeing all your wintery photos - you have so much drama in your seasons! I just watched the world news on NBC. Were those your flowers I saw. They sure did look like your work! Not mine!!!! Mine are now covered with more snow!!!! Great way to get some painting done! Hope Mother Nature doesn't cover them up tonight!!! Mother Nature did in fact cover them Joan!!!! 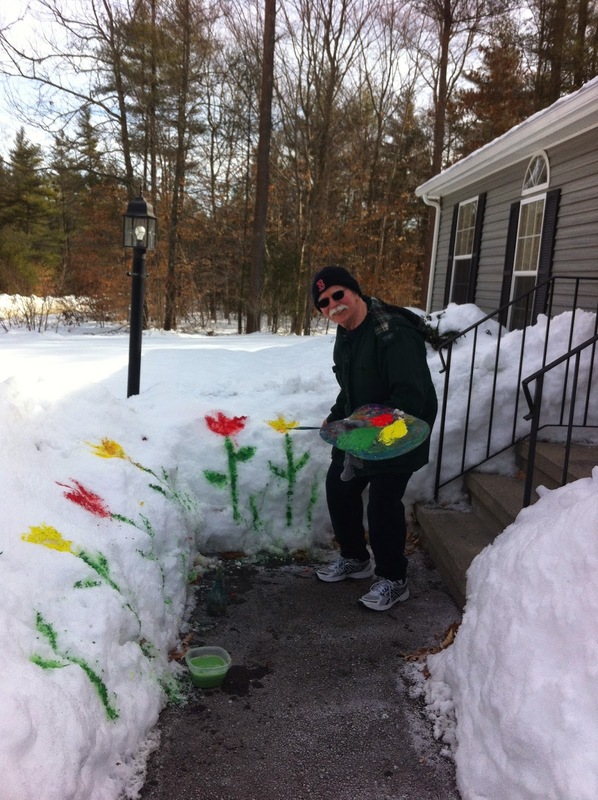 Now wait for spring thaw for painted flowers and real flowers!!!! MICHAEL! MICHAEL! IT'S RAINING HERE! FOR THE SECOND TIME THIS MONTH! ISN'T THAT GREAT!? OMG! WATER IS FALLING FROM THE SKY! SNOW IS FALLING IN THE LOCAL MOUNTAINS! Ha Ha... and you up there painting snow, I mean actually painting the snow, not doing a painting of snow! So funny you are Michael, so spirited! I think this is like your version of those Tibetan Monks and their sand paintings which are just as ephemeral. Really cool yours are, literally, cool to the touch! and Painting (right now) to the Sound of Rain (once again) Art Buddy! David! David! David! I am thrilled that you are having rain!!!! Yippee! Singing in the rain comes to mind! I also just saw on the news that in parts of Southern California they got some huge amounts of hail? Kids were playing in the hail like it was snow!!!!!! And I am thrilled that your mountains are getting snow! Water is so very important!! I am so happy that you can paint with rain light and hear the rain! I hope you went out into the rain and had some fun! For years we used to jog in the rain and snow and I loved running in the rain! I am so happy for you buddy! Maybe a rain painting in the works? Glad you are loving it! Good for you David! I wonder if CA ever looked into taking the salt out of the ocean water to use for drinking and farming? I am so happy you enjoyed the snow painting! You are right so like the Tibetan Monks and the American Indians with their sand paintings! Literally cool is so true! Again so happy you are getting some much needed rain! Enjoy David! Your Happy That His Southern CA Coastal Buddy Got Some Rain Buddy Michael! Now you don't have to feel guilty about painting with watercolors!!!! Yes! Hail in Huntington Beach! Almost unheard of in So Cal... ON THE BEACH! Apparently taking the salt out of ocean water, de-salinization, is VERY expensive to do and we would first have to build de-salinization plants. Yes, rain/weather paintings will be in my booth at the upcoming Art-A-Fair this summer. yesterday, it was almost completely empty. I see you're still as funny as ever. I like the idea. Hola Ricardo! Gracias! Always so nice to hear from you my art friend!!!! I am glad you enjoyed the photos! Always good to have a laugh! You take care amigo! LOL! Wonderful idea. You made my day))!